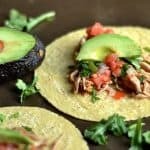 Creamy, perfectly seasoned, and smokey kick of the chipotle peppers make this shredded chicken your new favorite version of tacos. 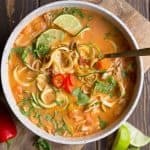 These can be made in the Slow Cooker or the Instant Pot. How nice is that? Well, hello there. I’m Amy, and my favorite night of the week is Taco Tuesday. 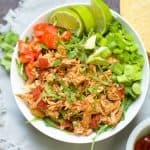 If you follow my blog and read my posts, you will know how much I love tacos, or how I pretend other foods can be tacos (like in my Slow Cooker Buffalo Chicken with Quinoa). The apple doesn’t fall too far from the tree, and my kids love it too. So taco night also produces a quiet dinner time (they are too busy chowing down to talk!). 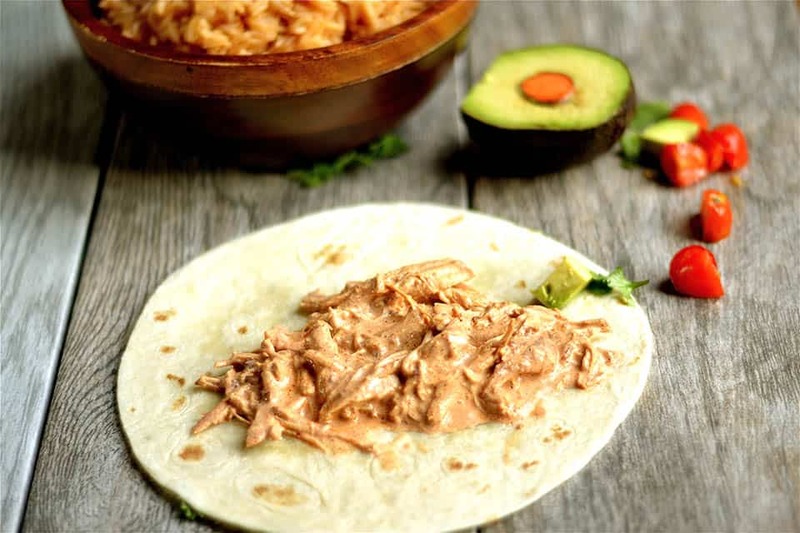 I was craving something creamy with my tacos, and I’m always craving chipotle peppers. So this came to my head the other day. It was super easy (I say that a lot, I know), but really super easy. I made this on a day where I worked a full day, grabbed my kids from school, and then had to turn around to take them to soccer practice. This was thrown in the crockpot just before 3 without me having to do anything, but assemble ingredients, and done for us to enjoy at 7:00. We were all very happy with this recipe. Very happy. Deliciously happy and we even had some leftovers. If you are serving this for less than 4 people, you should have a small amount of leftovers. Save it for something during the week. 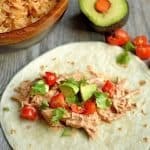 Throw it in a salad on another day, roll it up in a tortilla and pack it in your kids lunchbox. I’ve already been asked to do that this week! You can serve this so many different ways. 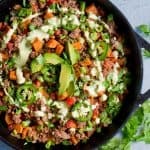 Make it as a topping for salad, throw it on a bed of rice with your favorite fix ins, or try it in a tortilla for traditional tacos. My favorite toppings for tacos include my Best Salsa Ever, 1 minute guacamole, and Spanish Rice. Begin by mixing together your seasonings in a small bowl. 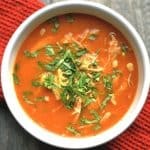 Add each of the wet ingredients (peppers to chicken broth) to the seasonings, and whisk together until it resembles a sauce. 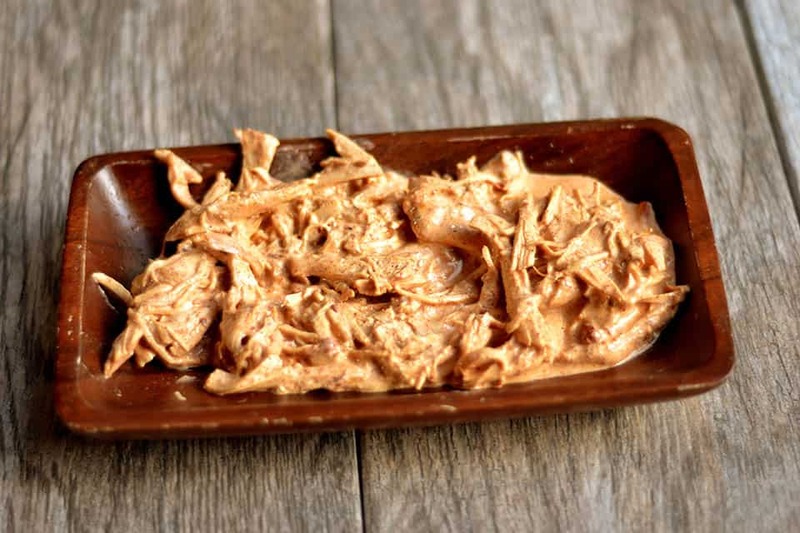 Place chicken breasts inside slow cooker, pour sauce on top. Cook on low for 4-5 hours. Check it at 4 hours to see if the chicken shreds easily and is cooked all the way. Add cream cheese to the hot mixture and return lid. Cook for another 10-15 minutes until the mixture is creamy and the cream cheese has melted. 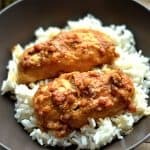 Place chicken breasts inside the instant pot, pour sauce on top. Secure the lid. Select manual, and cook on high pressure for 7 minutes. Once 7 minutes is complete, use quick release. Open lid and power off your Instant Pot. Shred your chicken with a fork, or remove and shred with a knife and fork. 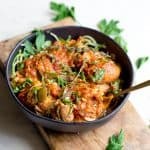 Place chicken back into the Instant Pot. Now select the Saute function and add in the cream cheese. Cook for a few minutes until the cream cheese has melted. *Use full fat cream cheese or else it may not mix well. 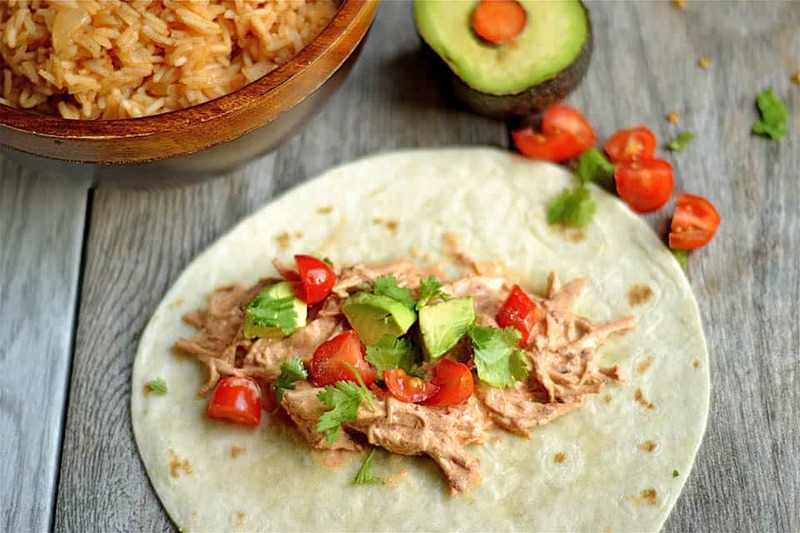 You can omit the cream cheese and just have delicious chipotle tacos! Goodmorning from the Netherlands! I am going to make this dish in a few days, but cab you please tell me if its is going to be very hot? ( my husband does not like things too hot) Perhaps I should put less chipotle in adobe in it? Hi Dominque! Yes, it’s a bit spicy. I would cut the amount of chipotle peppers in half. The cream cheese does help to tame down some of the spice! My chili powder is a pure chili, but a blend with cumin can work too. Thanks for the quick reply. Will let you know how it was for us, when I made this. It took a few months, but finally tonight we ate these. They turned out a bit on the dry side, after only 2 hours they were ready. Will be making them again, but I will use thighs instead. We ate them with some avocado and some tomatos, topped with sour cream. Als I would like to let you know, that your other recipe , the slowcooker Kung Pao chicken is a hit in this house. Literally the best tacos! Family absolutely loved this recipe. They were ready in about 4 hours and turned out great topped with lettuce, tomato, and my favorite avocado. Thanks so much for this recipe! I know, right?!?! These are my favorite tacos too. Glad you enjoyed them!